- Of the 1,000 gold medals, more than half have come from track and field (323) and swimming (246). 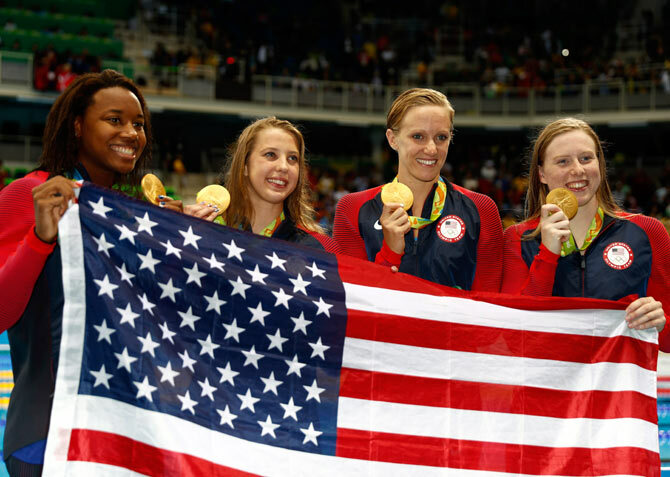 The United States won its 1,000th Olympic gold medal on Saturday when the American women's 4x100 metre medley relay team clinched victory at the Rio Games. The honour of reaching the milestone was shared by Kathleen Baker, Lilly King, Dana Vollmer and Simone Manuel, who got to the wall first ahead of Australia. "One thousand gold medals is a remarkable achievement made possible by the culture of sport that is the fabric and foundation of Team USA," United States Olympic Committee (USOC) head Scott Blackmun said. Of the 1,000 gold medals, more than half have come from track and field (323) and swimming (246), USOC added. The US team had arrived in Rio with 977 gold medals, according to Olympstats.com, and had sat on 998 for much of Saturday until long jumper Jeff Henderson put them on the brink with his victory. Sprinter Tori Bowie nearly took the US over the top in the 100 metres but she was finished second behind Jamaica's Elaine Thompson, leaving it up to the swimmers to complete the feat. "It really makes me think about all the generations of Olympic teams and athletes I watched and the inspiration that I have had," Vollmer said. "We're here getting that 1,000th medal for the U.S. and it seems absolutely incredible. "We've had an amazing Games and so many people getting their hand to the wall one after another we've fed off that and this is a great way to end." If the US women had not captured the landmark medal, Michael Phelps and the men's 4x100 medley relay squad would have done so, the quartet winning gold in the next event in the pool, which was also the final race on the Rio swimming programme. Manuel might have also had a chance to grab the 1,000th earlier in the 50 freestyle but finished 0.02 seconds behind Denmark's Pernille Blume. "It's really special that I could do it with the relay is amazing, just sharing it with three other women is icing on top of the cake," said Manuel. "I mean 1,000 gold for the USA is a nice number."